A Gentile woman who has a daughter who is tormented by a demon, comes to seek the help of Jesus. NEAR THE LANDof Galilee was a small country called Phoenecia. The people who lived in this country were Gentiles, and many of them were idol-worshipers. But because they lived so near to the home country of the Jews, many of them knew about the Jews’ religion, which taught of only one great God over all.The time had come when Jesus wished to be alone with his disciples that he might teach them deeper truths before he should die and rise again. So one day he took them for a long walk. They left Galilee and entered the neighboring country of Phoenicia. Here they went into a house, thinking that no one would disturb them there. But the fame of Jesus had reached those Gentile people in Phoenicia, and they were eager to see him. Soon the news of his coming spread through the neighborhood, and Jesus saw that he could not hide himself even in a strange land. Living in that neighborhood was one poor Gentile mother whose heart was very sad. She had a child, a little girl, who was tormented by a wicked spirit. This distressed mother had heard of the great healer in Galilee who cast out evils spirits and she longed to take her child to him. But she could not go. Then the glad news came that Jesus and twelve of his friends were visiting in a house near her home. Quickly she left her work and ran to the house where Jesus was. When she found Jesus she began at once to tell about the sad condition of her little daughter. But the great Healer of Galilee paid no attention to her at all! He seemed not even to hear her. 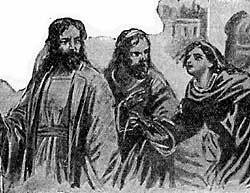 Then his twelve friends looked scornfully upon her because she was a Gentile woman, and urged their Master to send her away. The proud Jews called the Gentiles “dogs,” and no doubt this Gentile woman knew how the Jews spoke of her and of her people. But she was now willing even to be called a dog if only the great Healer would answer her prayer. So she said, “I know it is true that children’s bread should not be given to the dogs, yet we know that dogs eat of the crumbs that fall from the table.” And she, a Gentile “dog” wanted a crumb of the Jews’ healing bread for her afflicted child.